I have done it! I've jumped in to the biggest project I have ever undertaken. Previously the biggest project I ever tackled was the kitchen in the MoneyPit 1.0. Sure, that was a big job, but it was mostly demo and drywall repair and I had help from both a professional cabinet installer as well as from my dad. The master bathroom is going to be 100% ME! Let me give you a little tour of the 80s' brass and mirror monstrosity that I have to shower in everyday. 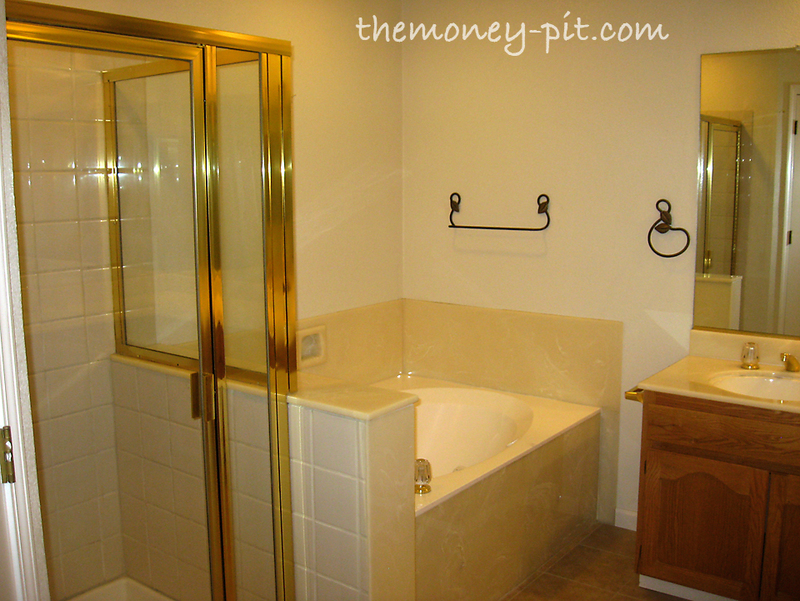 To the left of the vanity is a spa tub and shower. Note there is NO place to hang towels is this bathroom. A single towel bar above the tub and someone tacked on to the side of the vanity, but it is so low you towel hangs on the floor. Not good space planning. Most of the walls are covered in plate glass mirrors. You can see yourself from at least 5 different angles when standing in the shower. And in my case, that ain't pretty. Plus this room features the same overuse of brass and "crystal" fixtures and the dreaded honey oak just like in the guest bathroom. 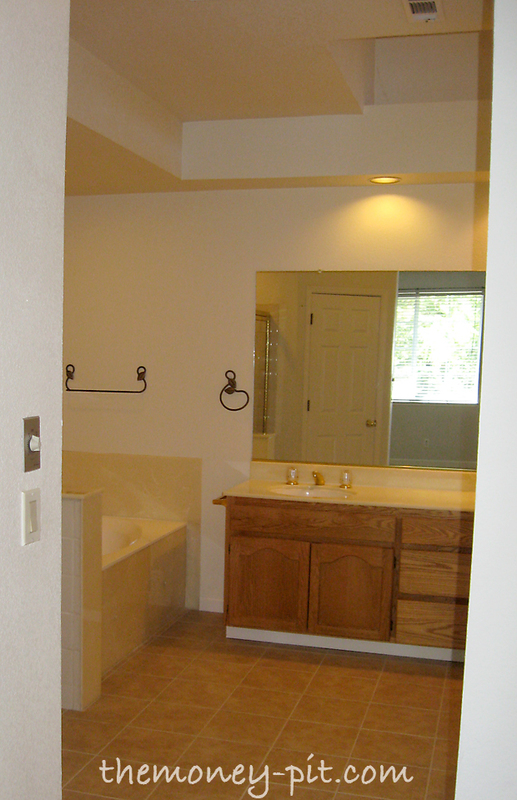 Lastly, the most labor intensive area of the remodel is going to be dealing with the shower and tub. The shower itself is currently white ceramic tile and while the tub is lined with "engineered" marble which has yellowed over time. 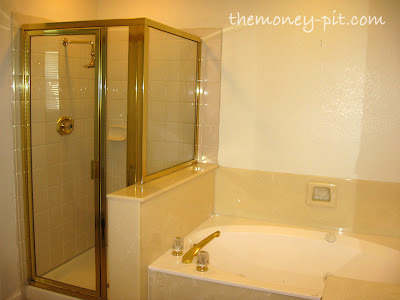 The thing I dislike the most is the brass shower surround as well as the small size of the shower itself. I am hoping to make it at least a little bit larger by removing the half wall between the shower and the tub. My budget is under $5000. I am going to tear out as much as I possibly can. EVERYTHING. Down to the studs if possible. The only things I won't change are the floor since that tile is less than a year old (installed right before we moved in by the previous owner) and the garden tub (since it is a plumbing and wiring nightmare). I also won't mess with the layout much, since if I have to leave the tub where it is, there isn't much else I can do with the vanity. For $5000 I am hoping to do all new tile, fixtures, countertops, sinks, frameless shower door, medicine cabinet, and upgrade the cabinets, lighting, and mirrors. My next post will be my inspiration photos of the look I am going for, and the shortcuts I hope to use to get the looks for thousands less. Fingers crossed! That's a big project, Kim! I'll be paying attention to all your work here, cause I almost need to do the same! I hope it all works out! We have a bathroom to tackle, but our budget would have to be about $20 right now, which wouldn't work for even the most frugal DIYer. You are so ambitious! Will love watching your progress. Have you gotten any bids for a frameless shower surround? I know ours cost about $2400, but we might have a bit more glass than your shower will need. Wow, this is an ambitious project. 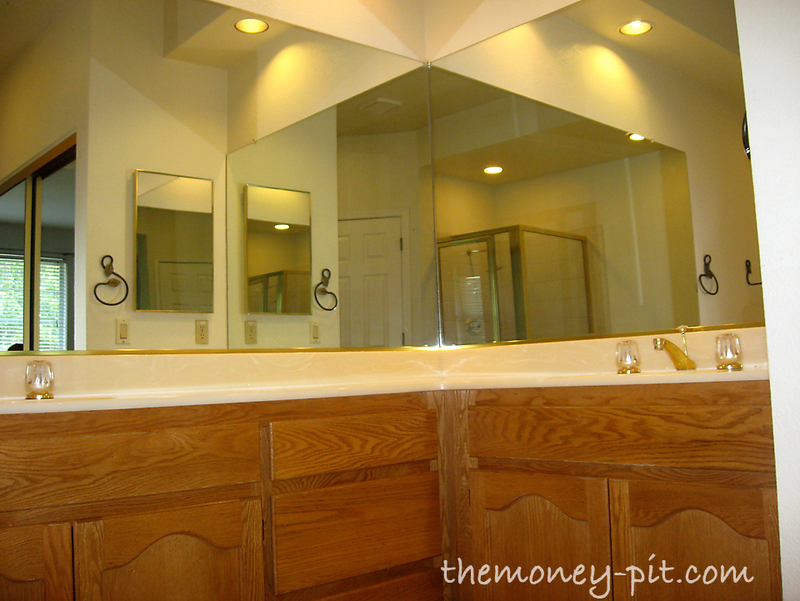 Have you thought about keeping the cabinets and redoing them? If you are not changing the layout this could save you a bunch and make your $5000 budget possible. I can't wait to watch your progress. Way to go on being brave enough to tackle a bathroom. My dad always said that any plumbing job takes at least three trips to the hardware store. I'm hoping you won't have too many! You go, girl! 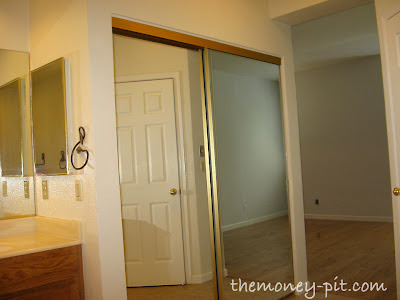 I'd have taken a sledgehammer to those mirrors long ago! The builder must have gotten them on sale ;). You are much more ambitious than I am, though. I probably would have just replaced them with smaller framed versions, painted and gone on from there. Good luck and keep us posted. If anyone can do this, it's YOU! I cannot wait to see what you do here! It is all so plain that it is almost a blank slate...So many options!!! I just saw this post and maybe it could work for your cabinets? 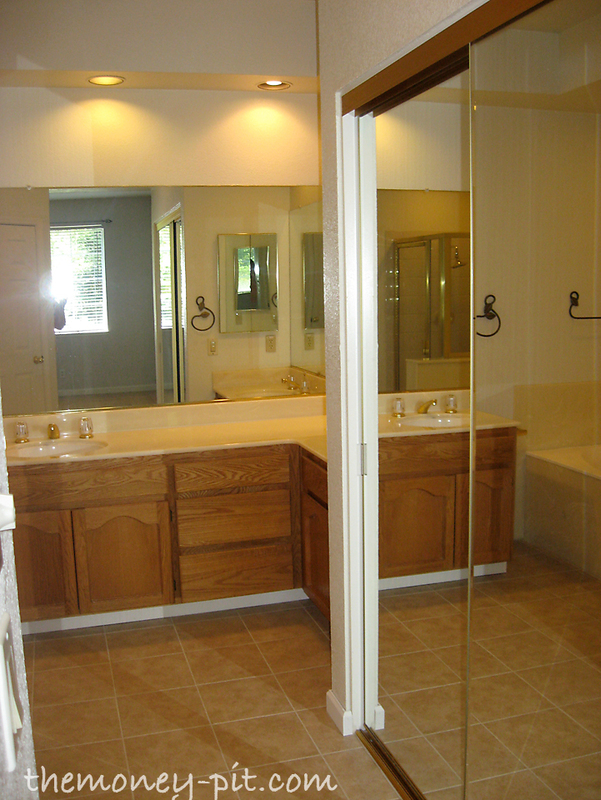 Maybe smaller framed mirrors, doorless tile shower (enlarge in both directions as much as possible) with the rain shower head? Okay this would either make me stop eating altogether, and I'd lose the baby weight (he's 16) or I'd stop showering forever! Wow that's a lot of glare...I suppose they thought it would make the room seem brighter and larger....???. We need to redo ours as well so will be following this carefully! Oh my goodness! You are such a brave woman! I cannot wait to see how everything works out! hahahahahahaha.....I so get you there!!! I am looking forward to seeing this progress. I too have a poorly arranged, completely outdated master bath which includes one of the smallest corner showers (really??) I've ever seen. I'm really hoping on 2013 being the year of my new master bath! Go for it! I'm going to learn all I can from you! shower but I know you can do it J. I’m looking into the Onyx collection for replacing my shower.